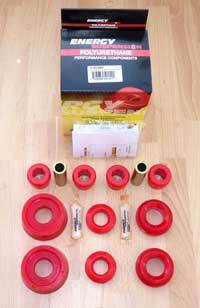 We are pleased to stock the complete range of suspension bushes for the PT Cruiser. They are made by Energy Suspension who are based in California and are the world’s largest manufacturer of performance polyurethane components. Energy have developed their bushes to improve the handling of any car without sacrificing ride quality. Polyurethane does not deteriorate like rubber, so these HyperFlex System bushes will outlast the PT’s original equipment ones. All bush sets are normally in stock for fast delivery. Deteriorating bushes on the lower control arms (wishbones) can be a problem on PT Cruisers. More so here in the UK and Europe than in the USA. It seems that our generally bumpier roads, with more corners, roundabouts and speed-bumps all combine with the PT’s fairly heavy weight to cause premature wear in the bushes. A knock from the front suspension is often due to worn control arm bushes where the rubber perishes or tears in the larger vertically mounted ones. 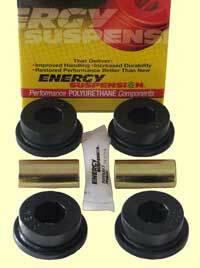 This Energy Suspension polyurethane set replaces the standard rubber ones to give a much longer life. (The set on my PT Cruiser was fitted over six years ago and is still perfect.). The set includes bushes for both sides. Click on photo for fitment illustration. For installation instructions click here. Note: There are three types available. 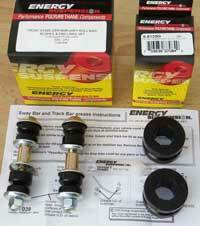 The Energy suspension bush set is the same in all three sets, the differences are in the fitting of the vertical bush. BS5 - Before fitting this bush set, the rubber in the vertical bush is cut out and the outer metal sleeve in the control arm cleaned of any remaining rubber. The centre metal sleeve also needs to be cleaned of all rubber and re-used. BS5a - The vertical bush is cut out and cleaned as with BS5 except the old centre metal sleeve does not needto be cleaned and re-used as a new one is supplied. BS5b - This set is designed for garages or PT owners who have access to a press. Installation time is faster as the old vertical bush can simply be pressed out and the supplied new outer metal shell pressed into the control arm. The new polyurethane bushes and the new centre metal sleeve are then fitted into the control arm. It is also a good idea to check the condition of the front stabilizer (anti-roll) bar bushes (BS6) as they have to be undone to remove the wishbone. Fits all 1.6, 2.0, 2.4, 2.4 Turbo & 2.2 CRD PT Cruisers 2000-2010. Please note: the centre and outer metal sleeves are exclusive PT Company items. 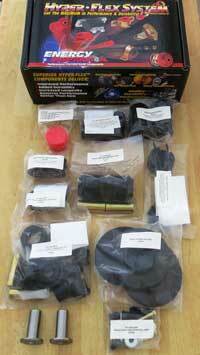 Complete bush kit for the front stabilizer (anti-roll) bar. Includes the end links (drop links) and the mounting bushes to improve road handling and give a longer life than the original rubber ones. Click on photo for fitment illustration. Set includes bushes for both sides. Fits all 1.6, 2.0, 2.4, 2.4 Turbo & 2.2 CRD PT Cruisers 2000-2010. 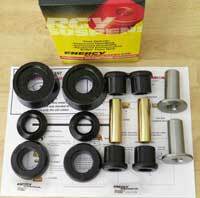 These Energy Suspension end links (drop links) use graphited polyurethane bushes and toughened steel to give a much longer life. Includes two links for both sides. Fits all 1.6, 2.0, 2.4, 2.4 Turbo & 2.2 CRD PT Cruisers 2000-2010. Complete bush set for the rear stabilizer (anti-roll) bar. Like all the other bush sets here, these polyurethane bushes have the double advantage of longer life and improved road handling. Click on photo for fitment illustration. Set includes bushes for both sides. Fits all 1.6, 2.0, 2.4, 2.4 Turbo & 2.2 CRD PT Cruisers 2000-2010. Polyurethane bushes to secure the trailing arms on the rear axle to the PT’s sub frame. Set includes bushes for both sides. Click on photo for fitment illustration. Fits all 1.6, 2.0, 2.4, 2.4 Turbo & 2.2 CRD PT Cruisers 2000-2010. On the rear suspension, the purpose of the watts links is to prevent any lateral movement of the PT’s beam rear axle. The end bushes of the two watts link rods take a lot of the strain in preventing any side to side axle movement. These polyurethane bushes are the perfect replacement, ensuring longer life and better road handling. Bush set for the outer ends of the two watts links. 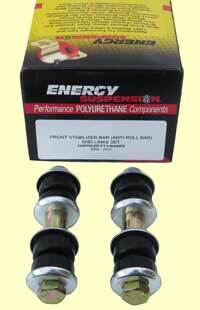 Also available is the stabilizer bar link which can be seen by clicking here. Click on photo for fitment illustration. Bushes enclosed to fit 40mm & 32mm diameter end bushes. Fits all 1.6, 2.0, 2.4, 2.4 Turbo & 2.2 CRD PT Cruisers 2000-2010. 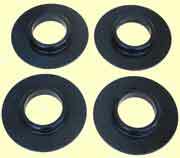 Set of four Energy polyurethane rear coil spring pads for the top and bottom of the springs. Fits all PT Cruisers 2000-2010. 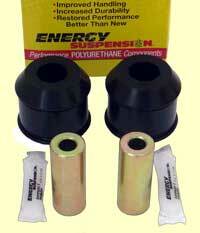 Set of 2 “bump stop” polyurethane bushes for the rear suspension. Click on photo to show these items. Fits all petrol 1.6, 2.0 & 2.4, 2.4 Turbo and 2.2 CRD diesel PT Cruisers 2000-2010. Code: BS4a £133.00 (includes VAT) Includes Centre metal sleeves for the Front lower control arm set. (See the BS5a set for more details). Code: BS4b £144.50 (includes VAT) Includes Centre and Outer metal sleeves for the Front lower control arm set. (See the BS5b set for more details). BS5AN - To fit this set, the existing vertical bush is removed by cutting out the rubber from the control arm. Any remaining rubber in the control arm is then cleaned up and the new polyurethane bushes fitted. 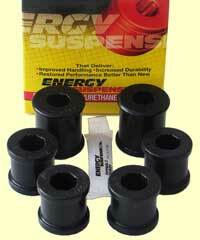 BS5BN - This set is designed for garages or Neon owners who have access to a press. Installation time is faster as the old vertical bush can simply be pressed out and the supplied new outer metal shell pressed into the control arm before fitting the new polyurethane bushes. It is also a good idea to check the condition of the front stabilizer (anti-roll) bar bushes (BS6N) as they have to be undone to remove the wishbone.